Burberry (full title Burberry Group Plc.) is a British brand founded in 1856. Burberry has always retained the manufacturing process in Great Britain or Europe (handbags are made in Italy), while other brands were outsourcing the production to cheaper third world countries, thus their quality and style has never been compromised. It is a brand that is proud of its British legacy and has maintained its place in the rank of elite fashion houses. The company's trademark tartan pattern is one of the most recognized patterns in the world and the most copied one too. Right now Burberry brand sells men's and women luxury clothing, runs a successful fragrance line, and has a remarkable handbags and accessories line as well. Most of attention goes to Burberry women handbags, but the Burberry masculine collections deserve it even more. This brand offers extensive collection of contemporary and very functional and comfortable Burberry men's messenger bags and Burberry briefcases, not to mention the Burberry laptop bags. If you are looking for a quality laptop messenger bag or leather briefcase, Burberry handbags for male clients will not disappoint you as they offer the widest range of various briefcases for men, canvas messenger bags and practical laptop bags as well. There are durable designer men's messenger bags in leather or in nylon. 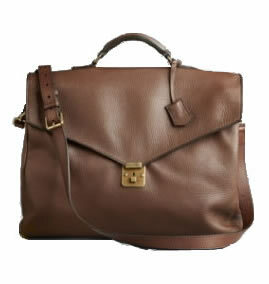 If you need a leather handbag, why not consider the traditional brown leather messenger by this British classic brand. You can purchase these briefcases and in Burberry stores or buy the men's bags online. 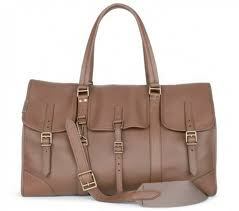 The quality is exceedingly better than the average men's designer bags and this brand's designs are classic. There is also a large variety of men's tote bags, crossbody messengers in famous check pattern and leather backpacks from the Burberry brand, see also the masculine model of the London bag in several styles and sizes or have a look at the smoked Check crossbody. If you cannot afford it right now, wait for the Burberry sales. This brand is worth waiting for. Although the brand is described as all the classic style, this season the totes for the masculine clientele have some more fun and funk added. For example, the medium nylon tote has more daring leather trims than the typically black and brown. This time they go for sky blue shade. 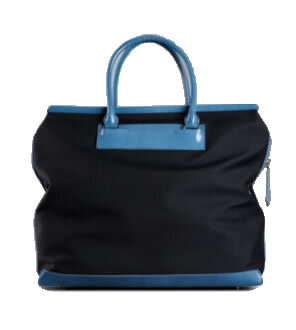 The particular tote model costs USD 1195.00 It has smooth nylon. The tote has an ascetic shape, it has double leather handles, There are inside pockets (one zipped three patch type). The hardware is made of brass. Its size is 46 x 42 x 18 in centimeters, in inches it is 18.1" x 16.5" x 7.1". For approximately same price of 1095 USD you can get this traditional briefcase in soft and grainy calf leather. IT features removable shoulder strap and traditional metallic lock. Inside there are two zippable pockets for documents or notebook. Its size in centimeter is 3 x 46 x 9 and in inches its dimension is 1.2" x 18.1" x 3.5". This briefcase is made in Italy. The lock has a brand's logo on it.